Last year at the annual The Hague Sculpture there was a cheerful elephant on this site. This year the organization presents a huddled fat woman holding her head in her ​​hands. This entry was posted in Figurative, Landscape, Still life, Visual art and tagged art, culture, drawing, elephant, fat lady, fine art, image, ink, iPad, Lange Voorhout, painting, print, sculpture, sketch, The Hague on 31/07/2013 by robvandoeselaar. This part of The Hague remains pictoresque in any season. See also versions in winter, with snow and without snow. 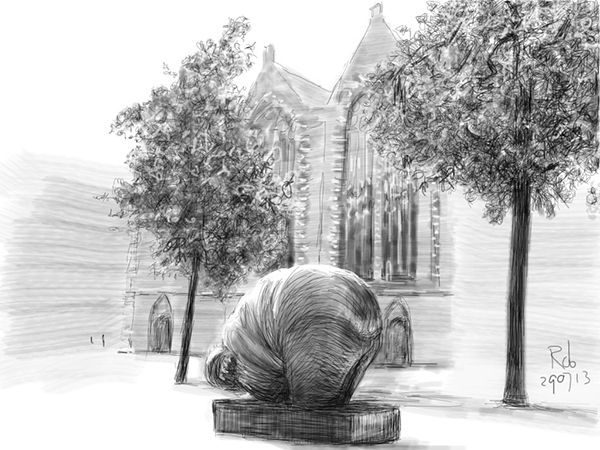 This entry was posted in Figurative, Landscape and tagged art, city, culture, drawing, fine art, image, ink, iPad, Lange Voorhout, painting, print, sketch, summer, The Hague, tree on 27/07/2013 by robvandoeselaar. During a heat wave, sunbathers decorate the edges of a dune path, before they are gone to the beach. 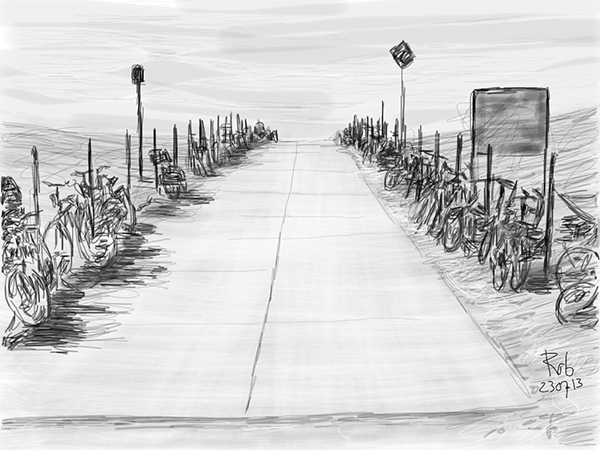 This entry was posted in Figurative, Landscape and tagged art, beach, bike, culture, drawing, dune, fine art, image, ink, iPad, nature, painting, print, sea, sketch, Sun, The Hague on 24/07/2013 by robvandoeselaar. His entire life Ulrich Mikloweit is cutting and pasting objects from typewriter paper. Inspired by M. C. Escher’s graphic prints he creates a garden of polyhedra. You can look through the objects and be surprised of what you discover inside. 6 Würfel, 36 Quadrate is a game of 6 hexagons (cubes) engaged in one another. I really like the shadow on the wall. You can see Ulrich’s polyhedra in Gallery Beeld & Aambeeld. The show runs until July 31. 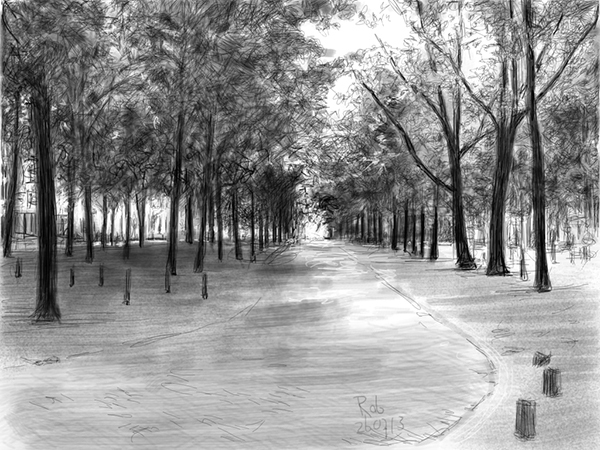 It is part of a series of exhibitions of ‘Bridges 2013’ in Enschede. I show my work in the Performance Factory, which is also part of the project. 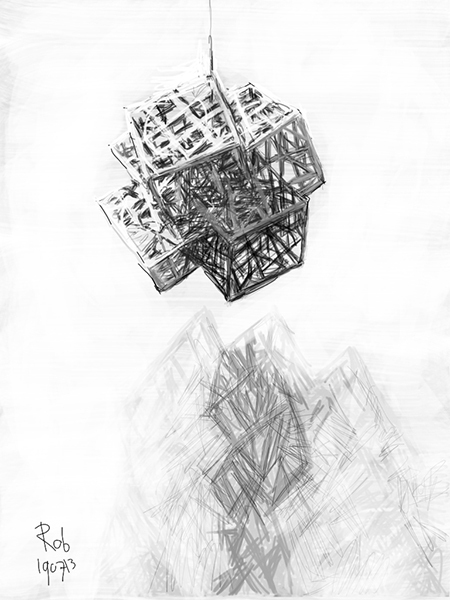 This entry was posted in Abstract, Figurative, Still life, Visual art and tagged art, culture, design, drawing, Escher, fine art, image, ink, iPad, painting, print, science, sketch, technology on 20/07/2013 by robvandoeselaar. The interesting exhibition ‘Paper’ at Saatchi Gallery in London shows artworks made of (mostly) paper. Yuken Teruya’s objects are remarkable. He cuts or tears trees from one side of a shopping bag (sometimes high end fashion boutiques, others MacDonald’s) and folds it inside. Then he places the bottom of the bag to the wall. The result is a peephole in which the light is shining beautifully from above through the cut out tree. 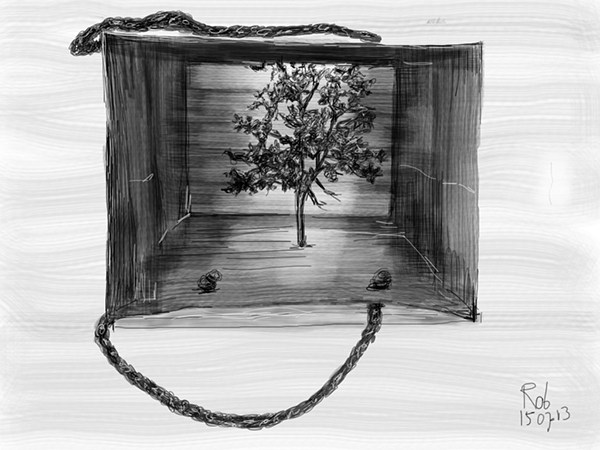 This entry was posted in Figurative, Landscape, Still life, Visual art and tagged art, culture, drawing, fashion, fine art, image, ink, iPad, lifestyle, London, MacDonald's, nature, painting, paper, print, Saatchi Gallery, shopping bag, sketch, tree, Yuken Teruya on 16/07/2013 by robvandoeselaar. On the occasion of a party in London where my son showed his graduation film, my daughter wore tight pants decorated with fine hand embroidery. 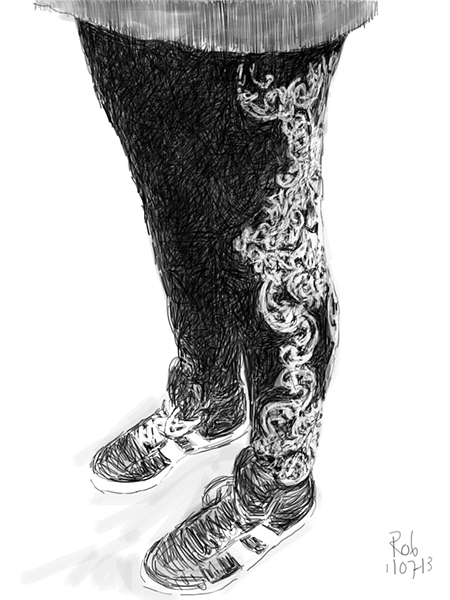 If you invert the drawing’s black and white, it looks like a beautiful dark tattoo on a white leg. This entry was posted in Figurative, Still life and tagged art, city, culture, drawing, fashion, film, fine art, image, ink, iPad, lifestyle, London, painting, print, sketch on 12/07/2013 by robvandoeselaar. I really love palm trees. They make me long for the tropics. Quite unexpectedly I saw a few in a secluded garden in London near Sloane Square. 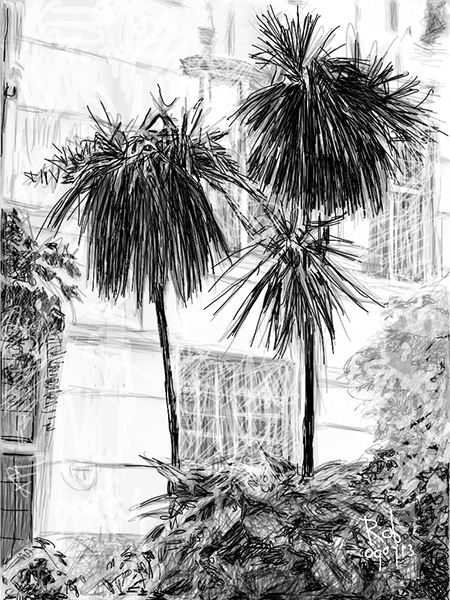 This entry was posted in Figurative, Landscape and tagged art, culture, drawing, fine art, garden, image, ink, iPad, London, painting, palm tree, print, sketch on 09/07/2013 by robvandoeselaar.